The season of festivals starts in India, now onwards. First comes Nagara Panchami. We, in Northern part of Karnataka (India), prepare two types of ladoos for Nagara Panchami festival. One is tambittu and another one is Chigali and we offer these two sweets along with popped jawar and roasted gram to Nagadevata. Today, I am going to tell you about Tambittu, which is prepared from puthani hittu (puffed bengal gram flour) and bella (jaggery). You might be thinking about another sweet, I have mentioned – chigali, I will write about “Chigali” in my next post. 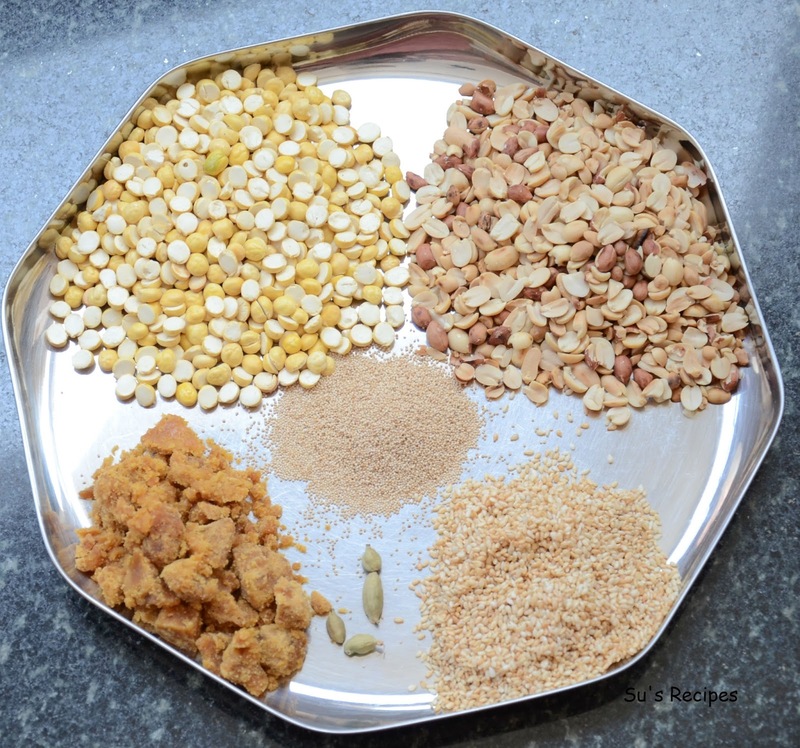 Puffed bengal gram or puffed chickpeas are known by different names in different states in India like Puthani, Hurigadale, Bhune chane and Phulay chane and etc. This sweet dish is very tasty and delecious, which is liked by persons of all age groups, especially kids like this dish very much. I made this recipe easy and simple for beginners and very less time consuming compared to other sweet dishes. Let’s see how to prepare the tasty and delicious “Tambittu” for Nagara Panchami. Clean the Puthani/Puffed bengal gram and grind it into fine powder with the help of mixer grinder. Sieve the grounded flour with the help of fine mesh flour siever. Keep it in a bowl. Crush the jaggery into small peices in such a way that it should desolve in ghee very easily. Keep it in a bowl. Grate the dry coconut. Do not make powder of it, grate it in such a way that it should be like strings. Don’t use fresh coconut, it may spoil the dish. Fresh coconut, inherently, has lot of moisture in it, which is not required for this dish.That is why we are not using fresh coconut for this dish. Place a small frying pan on medium heat and roast groundnuts for 5 minutes or until they get golden brown colour. Remove from the heat and allow it to cool down for 5-10 minutes. Remove the skin of groundnuts and crush them into two parts. There is a simpel technique for this process. Take roasted groundnuts in your palm and rub them with two hands to and fro, skin will leave the nuts. If you do the same process again with little bit pressure, nuts will breakup into two. You can try this, this is very easy and simple, isn’t it! Keep roasted and splitted groundnuts in a small bowl. Roast the til until they start splitting. It may take 2-3 minutes, because quantity is very less. Place small frying pan on medium heat and pour 25 grams cardamom in to it. Roast them until they start expanding in size and splitting. Allow them to cool for 10 minutes. Make fine powder of them (with skin) and store it in a bottle. You can use it instantly whenever you prepare sweets. It gives a pleasant aroma to the dish. You need not use any artificial essence available in the market. Place a frying pan (kadhai) on medium heat.Pour ghee in it, after 1 minute add crushed jaggery to it. Stir it continuously until jaggery melts and mix well with ghee. It may take 3-4 minutes. Take off the pan from heat. Soon after taking off from heat, add grated poppy seeds, roasted til, grated dry coconut and roasted groundnuts to it, one after the other and mix it well. Here, I have not roasted poppy seeds, because when we add poppy seeds to hot syrup, it will get roasted by the heat of syrup, that much heat is enough for poppy seeds. Immediately after mixing it, add puthani hittu (puffed bengal gram flour) by spreading it all over the jaggery syrap (chasni/paak). Mix it well so that all ingredients should mix together. If mixture becomes dry, you need not worry. Add 1 tea spoon of warm milk to it, the mixture will become soft to bind the ladoos. Or, if mixture becomes too smooth, you can add little more flour to it and mix it, it will be ready to bind the ladoos. Take a little quantity of mixture in hand, clump hands with mixture to tighten it. Slowly using inner palm, rotate it to make small balls. You have to give them cylindrical shape by pressing it by fingers up and down. This is a speciality of Thambittu, they should be cylindrical in shape. Your tasty and delicious Tambittu is ready for Nagara Panchami. I hope, this procedure makes you comfortable in preparing the dish.